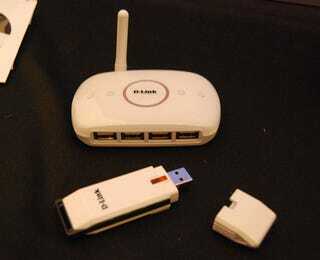 Remember that D-Link Wireless USB Hub that can reach a screaming 480Mbps at 10 paces? We caught a glimpse of it at ShowStoppers tonight; nice, sleek and white. (Not that there's much coming out in glossy white these days.) It wasn't yet operational, but once is, sometime towards the end of October, we'll give it a test run, not just using the dongle you see here, but using the built-in wireless USB found in the Lenovo T61 and Dell Inspiron 1720.